Sushi might be the food Japan is the most famous for. You can find it almost anywhere and just need fish and rice to make it. If you are coming to Kyoto, you probably are going to go and try some sushi, no matter whether it be served by a master chef at a small sushi restaurant with only counter seating, or on a conveyor belt. The way the sushi chefs make the sushi looks so cool that you probably want to try it yourself too, am I right? 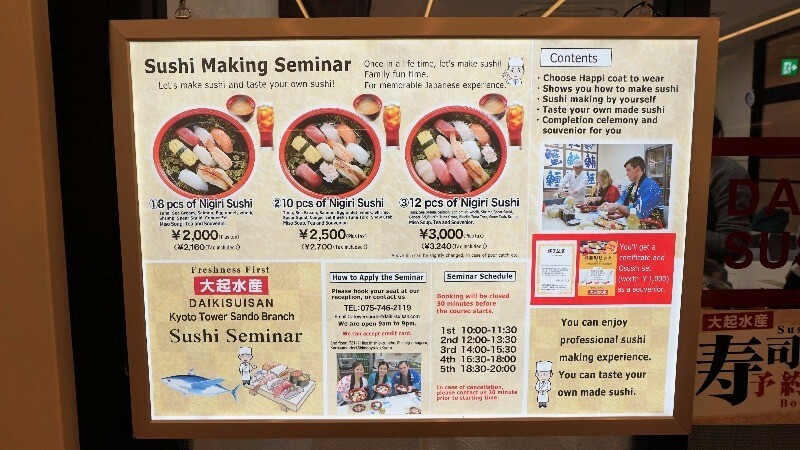 That’s where the Sushi Seminar by the famous sushi restaurant chain Daiki Suisan comes in. Located under Kyoto Tower, on the second floor of the Kyoto Tower Sando shopping center, you can try your hand at making sushi. This is a fun activity for the whole family that you should definitely consider when coming to Kyoto! The experience includes great fresh sashimi for you to put on the sushi and also such favorites as the Japanese omelette sushi. They have three choices available for you to choose from, 8 pieces for 2,000 yen, 10 pieces for 2,500 yen, and 12 pieces for 3,000 yen. The prices don’t include taxes. You will have a sushi chef by you who will tell you how to make the sushi, and then you’ll be ready to start. One piece of sushi should contain 18 grams of rice and after you have that much rice on your hands, just roll the rice to make the right shape. Then you just need the fish – and voilà – you have made sushi! So now it’s time to see if the sushi you made stands up to the sushi at restaurants you’ve had before! You even get a bottle of tea and a cup of miso soup to go with the sushi. After you have had your sushi, you get a certificate of completion with your name on it, some sushi lollipops and a hand towel with the Chinese characters for the fish used in sushi printed on it. The seminar is held five times a day. You need to book the course at least 30 minutes in advance, and if you want to cancel, this has to also be done at least 30 minutes in advance. Every time when I go to a sushi restaurant, I’m always amazed by the skill of the chefs. They make sushi making look so easy! I thought that sushi making was not that easy, but it was worth it when I got to eat a whole plate of sushi I had made myself, even if it was a bit harder than the ones made by a real sushi chef. But the sushi was, dare I say, really good! A 3-minute walk from Kyoto Station. Accepted at Kyoto Tower Sando or by phone. 8 pieces of sushi: \2,000 plus tax, 10 pieces of sushi \2,500 plus tax, 12 pieces of sushi \3,000 plus tax. The Sushi Seminar takes place under Kyoto Tower in a shopping center selling all kinds of souvenirs, so it’s very easy to get to. Although they don’t speak English, they have leaflets in English, Chinese, and Korean, and a video about how to make sushi they play on the TV, so this is a great place if you want to make sushi! Japanese, English, Chinese, and Korean.